Peaceful and perfect for divers. 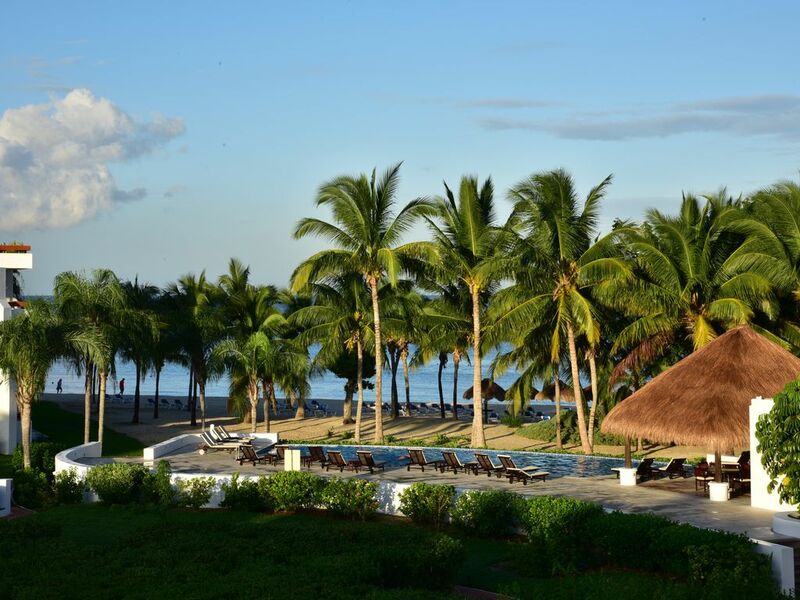 Our accommodations in 8310 at Residencia Reef exceeded our expectations. The unit is very well stocked including a thoughtful welcome basket from the owners upon arrival. The patio, and the view from the patio is spectacular. We enjoy cooking and had everything we needed to cook breakfast lunch and dinner. The beach is beautiful and quiet. Plenty of chairs and shade for everyone. We dove several mornings, the dive shop picked us up at the wooded dock, about a 7 minute walk from our unit. Travel distance to and from dive sites was only 10-15 minutes. The manager of the unit, Luis, is wonderful to work with and checked in with us within minutes of our arrival. Beautiful, clean, everything you need. It really feels like being at home. Having a washer/dryer was great! Wonderful pools and beach. Quieter location away from town, but nothing is too far away. Everything was in amazing condition and very good quality (from the kitchen, to the bedding). Maid service was a treat too. We are happy that your stay at RR 8310 was just what you were looking for. We do look forward to your return visit! Our family spent Christmas Break at Patsy's condo and we really enjoyed our stay! The condo had everything you needed and the bbq on the balcony was convenient. Patsy was very helpful providing information before and during our stay and arranged for our groceries to be delivered and put in the fridge (cold beer was a treat)! The welcome basket was a nice touch as well - after a long travel day - thank you. Snorkelling was excellent - right in front of the condo. The views from the balcony are just like the pictures - but better. Would definitely rent from Patsy again. Thanks for a wonderful vacation! My wife and I have been renting from Patsy and her husband for a few years and love every aspect of their properties. I dive every day and my wife is on the perfect beach or around 1 of 2 pools. Its just so great to come back to a very well maintained condo with all the modern conveniences. The condo has everything you need including a drying rack for dive gear on the balcony. BBQ is a nice touch and the cleaning lady is awesome. Patsy also makes the renting process so easy and furnishes a thorough contract and very useful info. for the condo as well as the Island. We will contine to rent from Patsy and her husband for a stress free vacation. The owners have thought of everything, down to freezable mugs already chilling in the freezer. All the little things are taken care of and everything works. Well appointed kitchen and comfortable furniture, cotton robes, beach towels, a first aid kit, lots of hangers, and an umbrella hanging in the front hall. The condo and the Residencias Reef complex itself are very quiet at night. The balcony is lovely for coffee and contemplation in the morning. This condo is perfect for a couple needing a relaxing quiet week of vacation, yet it's only a short drive away from the restaurants and stores in Cozumel. Thank you Nancy for your kind words! We never mind hearing about how our guests enjoy our units. Looking forward to your return! Great views sitting on the balcony with your coffee in the morning and a margarita in the afternoon. The condo was very clean and everything working correctly. Daily cleaning performed by the housing keeping crew. The pools and beach were great and everyone we met within to complex were all very nice. Great if you are a diver because your are closer to the reefs (less boat travel times), large gear rinse tank and gear drying tree on the balcony. Thank you Patsy!